Ever heard of Vitamin B17? It’s found in apricot kernels, bitter almonds and various other fruits and seeds – and there’s evidence, dating back 2700BC, of it’s incredible healing properties. In the1970s cancer doctors around the world – Dr Manuel Navarro (Philippines), Dr Ernesto Contreras (Mexico) and Dr Hans Nieper (Germany) Dr Philip Binzel (America) – were experimenting with B17 ( also known as Laetrile and amygdalin) and witnessing phenomenal results. 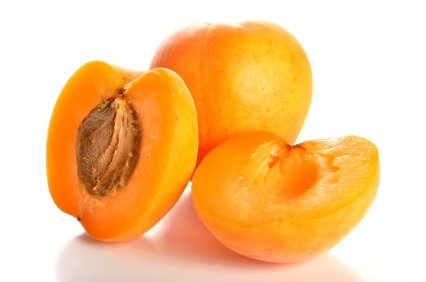 So how can apricot kernels reverse cancer? 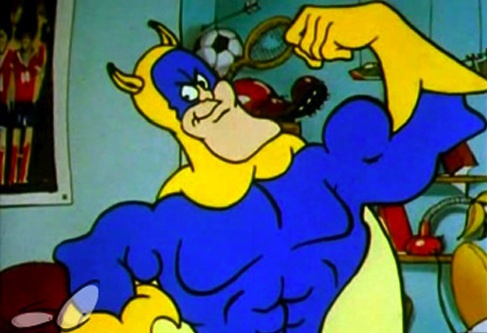 When this enzyme comes into contact with nitrilosides, an amazing transformation occurs – much like when Eric eats a banana. These nitrilosides turn into the tumourcidal trio of glucose, benzaldehyde and hydrogen cyanide. This trio attack cancer cells while leaving healthy cells alone. Dr Binzel’s book Alive and Well is full of testimonies from cancer patients brought back from the brink with Laetrile and nutritional therapy. One 44-year-old woman with metastasized colon cancer was still cancer free, 13 years after being treated with Laetrile (no chemo, no radio). The odds of her reaching a 5 year survival had she undergone ‘conventional’ therapy? Then there’s Polly Todd, a 59-year-old woman who was diagnosed with breast cancer (spread to her lymph nodes) in 1975. She was told her odds of survival were ‘slim’ and she was urged to have chemotherapy and radiation. Instead she chose to have Laetrile and nutritional therapies with Dr Binzel. When his book was published – 19 years later – she was 79 years old and had not had a recurrence of the disease. Dr Binzel decided to ditch chemo and radio in the 1970s and start treating his patients with nutritional therapies instead. Of the 180 patients Dr Binzel treated with primary cancer 87.3 % did not die of their cancer after 18 years. In the year that Dr Binzel published his results the American Cancer Society was officially reporting that with conventional treatment – involving early detection and primary cancer – 85% of cancer patients would die within five years. The FDA would have you believe that, since Laetrile contains cyanide, it’s dangerously toxic. To borrow a cockney phrase that’s just plain ‘chicken oriental’ (mental). A tonne of toxicity studies have been done on B17 confirming that it’s harmless to healthy cells. You only need look at the Hunza people in the Himalayas to know that a diet rich in apricot seeds will keep you in near perfect health. 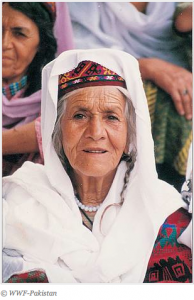 The Hunzas are renowned for their longevity – it is common for a Hunzakut to live to be over 100 years old. It is also extremely uncommon for the Hunzakuts to get cancer. But Laetrile is dangerous to some people – namely conventional oncologists, radiologists and anyone else who’s likely to lose out from the therapy becoming widely available. To understand just how much of a threat laetrile/B17/apricot kernels is to the cancer establishment, it’s worth reading Ralph Moss’ book The Cancer Industry. Ralph Moss was a Phd science writer when he was hired to work at the Memorial Sloan-Kettering Cancer Centre in 1974. He later became an assistant of public affairs where he was told to distribute negative statements about Laetrile. The following is taken from his now famous interview with radio show host Laura Lee. RM. …Shortly after I went to work there I went to visit an elderly Japanese scientist, Kanematsu Sugiura, who astonished me when he told me he was working onLaetrile (B17), at the time it was the most controversial thing in cancer ..reputed to be a cure for cancer. We in public affairs were giving out statements that Laetrile was worthless, it was quackery, and people should not abandon proven therapies. I was astonished that our most distinguished scientist would be bothering with something like this, and I said why are you doing this if it does not work. He took down lab books and showed me that in fact Laetrile is dramatically effective in stopping the spread of cancer. The animals were genetically programmed to get breast cancer and about 80 – 90% of them normally get spread of the cancer from the breast to the lungs which is a common route in humans, also for how people die of breast cancer, and instead when they gave the animals Laetrile by injection only 10-20% of them got lung metasteses. And these facts were verified by many people, including the pathology department. LL So this is verified, that Laetrile can have this positive effect? RM We were finding this and yet we in public affairs were told to issue statements to the exact opposite of what we were finding scientifically, and as the years went by I got more rapped up in this thing and 3 years later I said all this in my own press conference, and was fired the next day, “for failing to carry out his most basic job responsibility”–ie to lie to the public what goes on in cancer research. But even those who know the truth about Laetrile face an uphill battle getting hold of it. 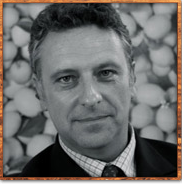 A few years ago Phillip Day looked into what was required to sell Laetrile in England. They health authorities informed him that he simply needed to buy a licence… and come up with 150 million to buy the licence. You can order apricot kernels, grown without pesticides or other chemicals, from the Credence Website. ‘The great thing about apricot kernels is they come with their own enzymes. So they’re a belt and braces treatment in one,’ said Day. The vital difference between eating the apricot kernals and having Laetrile/B17 injections is that the latter must be done in conjunction with enzymes. Pancreatic enzymes are essential to break the shell of the cancer cell – so the Laetrile can get in and do its work. You can read more about enzymes here. Mum discovered this vital information when she was chatting to her friend Barbara while having Laetrile one day. Barbara recommended she take a particular enzyme supplement called Univase Forte. Barbara’s son is currently battling brain cancer and, as you can imagine, she’s doing everything in her power to ensure he has the best chance of survival. But sometimes the red-tape that surrounds so many of these alternative treatments, makes her feel like she’s banging her head against a brick wall. A few weeks ago there was a problem with Barbara’s order of Laetrile. Having Laetrile therapy in Australia requires you to jump through so many hoops it would test even a Cirque Du Soleil performer and, with all the calls to Mexico and complicated forms to fill out, it also demands the patience of a saint. And that’s just who Barbara decided she needed to call on a few weeks ago. When her son had gone two weeks without Laetrile Barbara started to panic – and pray. 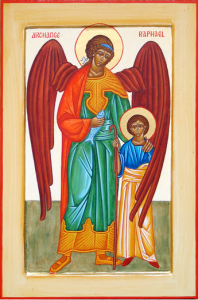 For three consecutive nights she called upon Archangel Raphael, who looks over healers and healing, to aid in the swift delivery of this much needed medicine. Barbara explained how desperate she was for the package and the man promised to do his best. She left her number. Barbara thanked the man profusely. ‘What is your name?’ she asked. yet another beautiful page! and what a lovely story to finish with! i’ve heard that pawpaw is even better than apricot kernels and so much more beneficial too! the great news is they grow really well here in WA and all you do is find somone with a tree, clip a limb off and put leaves and sticks into a pot and boil them up and drink the tea. very beneficial to everyone! Oh thank you both for sharing all this interesting/invaluable health information. I also live in Perth so have used many of your recommendations, from dentist to stockists and look forward to each weeks next instalment. The last wee story is gorgeous. Thank you & wishing you & your family well. I simply can’t wait to read your blogs each week and discover what other options, natural sources and truths that are out there. My partner has esophageal cancer and has had chemotherapy treatments and is now on a conventional experimental treatment. I hope and pray that he reads your blog each week when I email it to him and that he decides on a natural alternative approach sooner rather than later. Keep up the fantastic work and you are a source of inspiration and knowledge for us all. Thank you for sharing this with the world. We’ve been using apricot seeds from ChiTree to good effect. One benefit we’ve noticed is that they seem to be a natural pain killer. This is a wonderful post! Thank you for sharing this! And everything you wrote is true! I battled cancer for two years, and I finally beat it with B17 (a concentrated form of apricot kernels). Bless you for sharing this information.